Since 2008, more than 770 city, county and state housing trust funds have been created, and in 2015 they generated approximately $1.3 billion to support unmet housing needs in their communities. These funds, along with the long-awaited National Housing Trust Fund’s first distribution of $174 million to the states earlier this year, have combined to create measurable impact on housing preservation and production nationwide. Through this national survey of funds, the report provides an excellent snapshot of the nuts and bolts of creating, managing and implementing a housing trust fund. Graphs and charts illustrate the breadth and diversity of how funds are capitalized; who administers them; eligible applicants and eligible uses of the fund; household income levels served; and long-term affordability requirements. There are also examples of how these funds can be used to address our greatest housing challenge – serving persons with extremely low incomes. While not all funds have dedicated sources of revenue, those that do most frequently rely on a real estate transfer tax or document recording fees for funding. Other sources of revenue include developer fees, tax increment financing, housing bonds, or dedicated funds voted on in a ballot initiative. 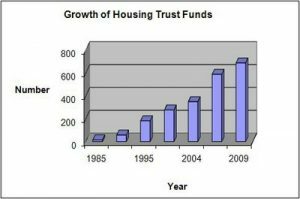 A few trust funds have even dedicated 100% of their resources to ending homelessness in their communities. Highlighting Success: The City of Alexandria’s Housing Trust Fund From 1980s to Today was showcased as an example of one of the best practices discussed in the report. Secure a dedicated source of revenue in each jurisdiction that identifies housing needs and adopts housing goals to ensure a continuity of funds to preserve and develop housing that’s affordable.